In “The Return,” a visually evocative 90-second brand film from Impossible Foods and production house Object & Animal, an astronaut explores a familiar green world teeming with life. He keeps up a running commentary of his impressions as if reporting back to mission control. Hip-hop artist Fatlip from The Pharcyde provides the voiceover, and his appropriately earthy tones convey a wealth of emotion that jibes perfectly with the film’s poetic, poignant imagery. “I’ve dreamt of this planet for so long,” he says at one point, kicking back on the grass, as the camera switches to his point of view, and we watch a caterpillar wriggle across his helmet visor. “This is paradise,” he concludes, as actor Willie Wright, who actually performs the Earth-walk, opens his faceplate and takes a deep breath. Director Nick Walker, best known for making music videos, delivers the goods throughout, crafting a delicate, simple story that gains power and depth with each cinematic frame. 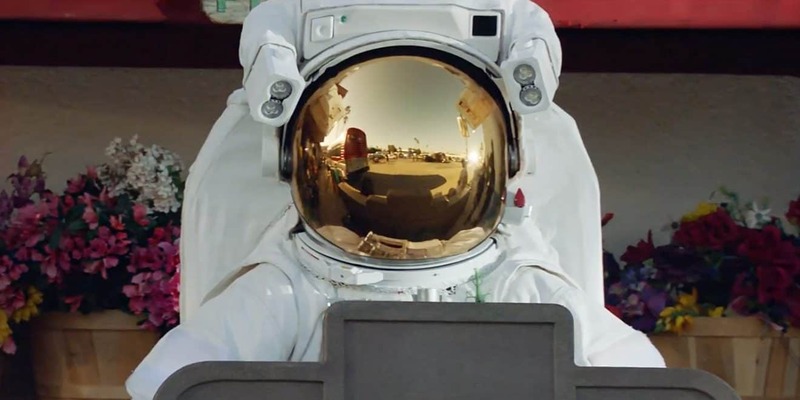 An urban bus-stop sequence is especially notable, as the vehicle recedes in the astronaut’s visor just before he gently lifts a praying mantis on his glove. At one point, in the woods, the curve of the explorer’s headgear seems to fuse in the sunlight with the shape of a nearby turtle’s shell, suggesting the sacred connection among all life forms on our fragile world. Near the end of the film, the message, “We’re on a mission. And it’s not to Mars” flashes on the screen, followed by Impossible Foods’ web address. The lack of overt branding or a noisy call to action allows viewers to savor the storytelling and preserves a sense of mystery. “The Return” landed yesterday during a special event at the Elizabeth Street Garden in New York City, and the brand will dispatch an astronaut to traverse Manhattan’s spaces and build buzz on Thursday. With the temperature expected to graze 90-degrees, let’s hope the dude’s cooling system works, or else he’ll feel like he’s burning up on re-entry.